Don’t let the winter put a chill in your bones, call Quality Air Heating and Air Conditioning for all your heating service in Pickerington, OH. Whether you need a new system installed or if you need repairs, our specialists can help with any job that you have. We can work on a large range of products including gas, electric, and propane furnaces, heat pumps, geothermal systems, ductless mini split heaters and more. Call us today to talk with one of our Pickerington, OH heating service experts. When your heating system breaks down it can leave your home cold and uncomfortable. Quality Air Heating and Air Conditioning offers high quality heating repair in Pickerington, OH for many types of systems. If your furnace is blowing cool air or your heat pump is making a new noise, just give us a call and we’ll be at your home in no time to fix the problem. We know that things don’t always happen on a predictable schedule, which is why we offer 24/7 emergency heating repair in Pickerington, OH. Buying a new heater isn’t like going out and buying a cup of coffee. You’re going to have to live with your decision for many years. Make sure that you consult with the Pickerington, OH heating installation professionals at Quality Air Heating and Air Conditioning before you make any decisions. We can talk with you about all of the different heating options on the market and we’ll make sure that the system you choose is the right size and that it fits in your budget. Call us today for your heating installation in Pickerington, OH. Surviving the winters here is one thing, but we also need a good air conditioning system to stay nice and cool during the hot and humid summers. If you need air conditioning service in Pickerington, OH then Quality Air Heating and Air Conditioning is the company that you want to call. We offer quality air conditioning service in Pickerington, OH for all makes and models of systems. From heat pumps and central AC to ductless mini splits and geothermal systems, we have you covered with high quality repair, installation, maintenance, or replacement. Call us today to learn more. If your air conditioning system is leaking water, icing up, making a strange noise or blowing warm air, you need to call Quality Air Heating and Air Conditioning immediately for air conditioning repair in Pickerington, OH. These types of problems only get worse with time so make sure that you call us as soon as you notice a problem. We’re available 24/7 for air conditioning repair in Pickerington, OH. Maintenance is something that more homeowners need to get for their air conditioning systems if they want them to keep operating at peak performance. Quality Air Heating and Air Conditioning provides an outstanding air conditioning maintenance program in Pickerington, OH that includes regular tune-ups, reduced pricing for our members, priority service, extended warranties and much more. Call us today to find out more. Nothing lasts forever, especially your air conditioning system with all the use that it gets during the summer. If your AC is getting older, operating less efficiently, or starting to require more repair, you may want to start considering the option of replacing your AC. Quality Air Heating and Air Conditioning is here to help with high quality air conditioning replacement in Pickerington, OH. We’ll make sure that your new system is the right size, and that it is installed safely. Give us a call today to talk with one of our friendly experts. When it comes to the HVAC system at your business, you need a contractor with skill, experience and also a dedication to your satisfaction. Quality Air Heating and Air Conditioning is the company to call. We are proud to work with businesses of all types and we are focused on providing you with the best possible service on every job. We provide total commercial HVAC service in Pickerington, OH for all types of equipment including large components like chillers and cooling towers. Call us today to talk with one of our commercial HVAC experts. If you’re like many business owners, then you probably keep your HVAC system operating almost constantly to keep the interior of your business comfortable throughout the year. All of this extended use could cause your system to break down at some point and require repair. If you aren’t getting enough heating or cooling or if your system is making any weird noises, call Quality Air Heating and Air Conditioning for commercial HVAC repair in Pickerington, OH. We’re available 24/7 for emergency HVAC repair as well because we know that your business never stops and you could require assistance in the middle of the night if something goes wrong. Don’t risk the future of your business by having your new HVAC system installed by an amateur or non-professional. Call Quality Air Heating and Air Conditioning anytime you need commercial HVAC installation in Pickerington, OH. We will help you through the whole process and do more than just show up the day of the install. We can help you from the very beginning to pick out a new system that fits your business’ needs as well as your budget. Our technicians are standing by to take your call. Maintenance is something that business owners everywhere should be taking advantage of. Not only can regular commercial HVAC maintenance reduce repairs, it can also increase efficiency and extend the life of your system. 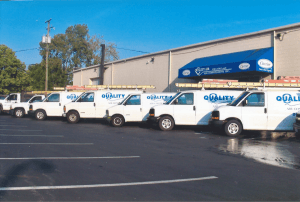 Quality Air Heating and Air Conditioning offers total commercial HVAC maintenance in Pickerington, OH for businesses of all types and HVAC equipment of all types. Our maintenance program members enjoy reduced pricing, priority service, extended warranties and many other benefits as well so call us today to find out more. When your heat pump stops working it can be a huge deal-especially if it’s the dead of winter or a hot summer day. Quality Air Heating and Air Conditioning offers 24/7 heat pump repair in Pickerington, OH in addition to a full line-up of other services as well. Need a new heat pump installed? We can help you find the perfect system for your home and then get it installed quickly. If you’re wondering about what heat pumps are, just give us a call and talk with one of our Pickerington, OH heat pump experts. Furnaces are terrific heating systems, but, like any other piece of equipment, they can sometimes break down and require repair. For all your furnace service in Pickerington, OH including repair, installation, maintenance, or replacement call Quality Air Heating and Air Conditioning. We can work on all types of furnaces including electric, propane, and gas models so call us whether you’re ready to replace your existing furnace or if you’re ready to set up maintenance visits from our technicians.